Cake is an American alternative rock band from Sacramento, California. Noted for their idiosyncratic approach to music, Cake became popular in the late 1990s with their album Fashion Nugget, which spawned several singles, with "The Distance" being the highest-charting single. 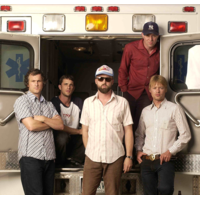 Cake's musical style is characterized by lead singer John McCrea's half-sung, half-spoken vocals and lyrical wordplay. The band has switched out several members in the years since its first album, Motorcade of Generosity, in 1994. Their sixth full-length album, Showroom of Compassion, was released on January 11, 2011.